A headless sculpture of Buddha belonging to the Chola period of 10th century AD was excavated from a sugarcane field at Manalur village in Thanjavur district of Tamil Nadu. Both the head and the right hand of the granite statue were missing when it was excavated. The findings of Buddha sculptures in and around the area show the existence of a Buddhist temple in Thanjavur. The three-foot long sculpture of Buddha was discovered by Buddhist scholar B. Jambulingam and heritage enthusiast Mani Maaran. It was found based on information given by a school teacher, Sethuraman. Since 1980s, Jambulingam has identified 67 Buddha idols in Thanjavur, Tiruchi and Pudukottai districts during his field study. “The iconographical features of the sculpture show similarity to those found in the region earlier, mostly belonging to 10th-11th century AD. 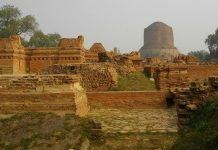 The findings of Buddha sculptures in and around the area show the existence of a Buddhist temple here,” The Times of India quoted superintendent of Tamil University Jambulingam as saying. In Thanjavur, Buddha sculptures were found in various places and the prominent among them are those in Vayyacheri, Cholanmaligai, Kumbakonam, Madagaram, Manganallur, Pattiswaram, Perandakottai and Vikramam. Jambulingam said that there is a possibility that the headless statue belongs to the head found earlier in Vayyacheri. Buddhism came to Tamil Nadu during the 3rd century BC and prevailed in the Chola country up to the 16th century AD.